Two sisters came from the community of Mostoles with about 20 girls. Esmeralda, our dearest cook, monitor and councilor also joined up with us. It all began on Thursday, November 1, with lunch. That day the entire celestial army was united, with Our Lady at the head, to throw a line of help to the other army, which is less celestial, made up of girls and sisters. 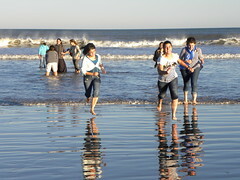 After lunch we went to the beach to pray the rosary and to have a meeting about how to live the get-together. And of course, we had a sand, mud and water war. As a prize, all of the survivals were able to attend Mass with Father Henry, S.H.M., who encouraged us to be saints with a two-sided drawing. On one side it was a beautiful princess (which is like us when we are close to God), and on the other side an ugly old woman (which is like us when we are in sin). After supper we had a Holy Hour. In the presence of Jesus in the Blessed Sacrament, we were inspired with the example of Marta Obregon, a young girl who preferred to lose her life in order to defend her chastity. 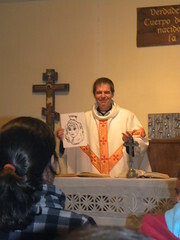 On Friday, November 2nd, we had a reunion about confession and sin. Later on, there were confessions and Mass. And afterwards, we still had time left for the arts and crafts, in which we made a hand bag. 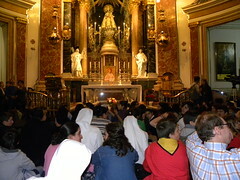 After lunch, we went to Valencia to visit Our Lady of the Helpless. We were also able to see the Holy Grail, and they explained to us its story. We had supper in the patio of the Virgin and later we went to the vigil for the youth with Archbishop D. Carlos Osoro. Two of the girls, representing all the rest, were able to put the incense before the Blessed Sacrament. 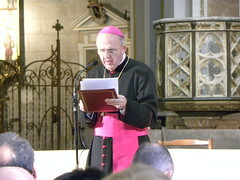 Archbishop Carlos encouraged the young people to be apostles of the youth. Saturday morning we went outside to play games. All the trials of the games were related with faith, since we are in the Year of the Faith. We had a barbeque lunch, and later watched a movie called, “Courageous”. When the movie finished we went to Mass in the parish. In this way, we were able to give a testimony of youth who practice their faith. After supper, we played a night game that also had to do with the faith, more than anything because we had to go through the entire house in the dark. 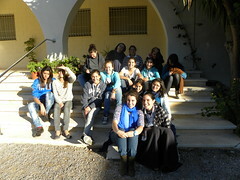 The last day, Sunday, we went to Mass in the Dominican Convent. The girls were able to talk with the Dominican Sisters there for a time and tell them their experiences of the get-together. Back at the house, we had a last reunion, lunch, and then it was time for everyone to leave for their homes. 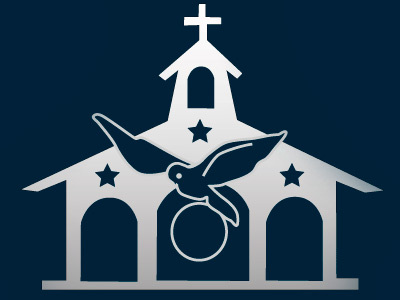 We give thanks to Our Blessed Mother for this weekend get-together and for so many other opportunities that she gives us to grow closer to her and to Jesus.